the Mad Professor, with hundreds of singles and over 40 albums to his credit. Andy has performed and recorded with Bristol, England-based trip-hop pioneers Massive Attack since their debut album in 1991. Big Youth, once of Jamaica's heaviest hitmakers since his debut single "Ace Ninety Skank" in 1972, took the spoken deejay style perfected by U-Roy several years before, added his own American soul- and poetry-inspired influence, and pioneered the art of the singjay (singer/deejay). His debut album Screaming Target remains fresh and essential. He has released hundreds of singles and at least 19 albums. Sampled by the Beastie Boys and cited as a primary inspiration by the Clash, Big Youth possesses unique versatility, with equally powerful command of infectious vocal melody and ominous spoken word. Michael Bell, a/k/a Dr. Bassie, studied bass with Kings Go Forth/Brothers by Choice bandleader Andy Noble. He and Eric Blowtorch formed the Welders in 2007, collaborating with producer Shane Olivo Prince Jazzbo; and Rico Rodriguez on two singles, "Salt Water" and "Most Dangerous Man," and an album, The Alphabet. An accomplished songwriter, vocalist, and producer, Dr. Bassie operates the new label Fe True Records and recording facility Studio Two in Shaker Heights, Ohio. Eric Blowtorch began singing and playing guitar in 1984 with the Blowtorch, who released one single and four cassettes. As a bandleader, assisted by scores of Milwaukee- and Kingston, Jamaica-based artists including Paul Cebar, Roland Alphonso, Clement "Sir Coxsone" Dodd, Black Uhuru, and U-Roy, he has released five singles and five albums. Noted for smart lyrical content, rhythmic variety, and a keen ear for melody, he has performed in London, Toronto, Kingston, and half the 50 states. Every Saturday he hosts a radio show, Eric Blowtorch Live, on WXRW-LP in Milwaukee. Shane Olivo, engineer and arranger, is well known as guitarist in ska/reggae sensation Highball Holiday and vocalist/guitarist for high-energy rock/dance ensemble the New Loud. A voracious listener and fan of all varieties and vintages of music, he has run Bobby Peru Recording since 1996. Fallout Boy recorded their debut album at Shane's studio, and recent power pop sensation Direct Hit! has recorded exclusively with Shane. Fe True Records is a new record label specializing in music of Jamaican origin and influence. The inaugural release, I Versa Rockdown (album download), features Mr. Holden Laurence and Michael O'Brien on vocal/guitar and drums, respectively. Fe True's second release, Dr. Lawson Come Forward (EP download), features The Cultivator, from Kingston, Jamaica, former assistant to Bob Marley and The Wailers. "Straight to Hell" is Fe True's first single release. The Clash: brave, roaring voices of liberation and inspiration. Horace Andy: the lonely, quavering whisper that awakens you with a jolt of warning. Two cross-cultural entities known for destroying musical barriers and giving voice to sufferers the world over. Allies in music and message, they were bound to collide. Clash singer/guitarist Joe Strummer and Horace Andy first collaborated in 1999. Strummer had written the militant title track to Andy’s Living in the Flood album. Recently Milwaukee singer/guitarist/songwriter Eric Blowtorch, who’s worked with many reggae artists over the years and had known Strummer, asked Andy if it was true he’d once sung his own version of a Clash song. Yes, Andy replied, he’d once recorded a version of “Straight to Hell,” but he didn’t like the way it turned out. He felt it needed a new rhythm track. Blowtorch felt a jolt of anticipation. 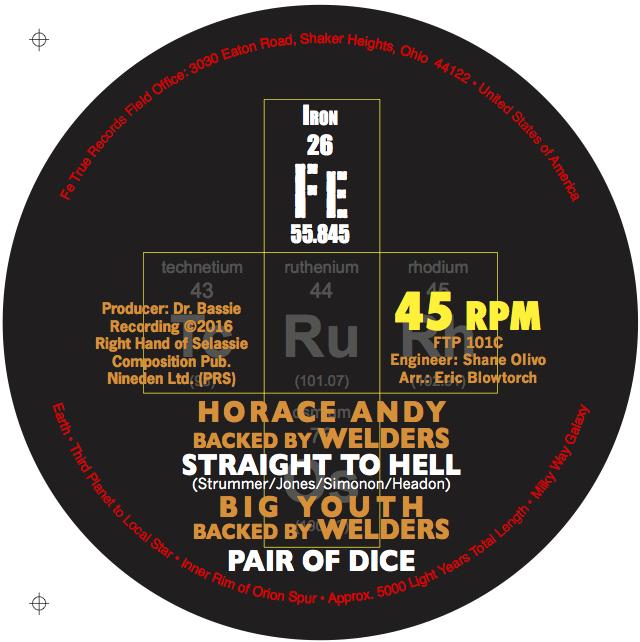 Out of that conversation comes one of 2016’s most arresting reggae releases: Horace Andy bringing his singular style to a brand new roots reggae recording of “Straight to Hell,” (Fe True Records 12-inch single on March 16th and digital download on April 14th) backed with deejay versions voiced by the venerated Big Youth. And 10 per cent of the proceeds will go to Doctors Without Borders, the international organization known for tending to the health needs of people in direst need in the most dangerous places. In the 34 years since its original release, “Straight to Hell” has become one of the Clash’s most beloved songs, a standout among even their eclectic body of work, recently sampled for “Paper Planes,” M.I.A.’s chilling piece about immigration. Blowtorch decided to completely re-fashion the entire song, working from the ground up to suit Andy’s voice. With Blowtorch’s Welders bandmate and Fe True Records founder Michael “Dr. Bassie” Bell on bass, celebrated Latin drummer Cecilio Negron, Jr., on drum kit, Milwaukee soul/jazz/chansons singer Robin Pluer on organ, and an all-pro horn section, this take on “Straight to Hell” – which first appeared on the Clash’s Combat Rock in 1982 – captures the song’s cry of compassion for refugees and immigrants, Andy’s spectacular vocal performance rising from a gentle lullaby to a cry of anguish. It’s a natural fit for the singer who first came to prominence with Studio One in 1972, enjoying numerous Jamaican hits with “Skylarking,” “You Are My Angel,” and “Money Is the Root of All Evil” before ascending even higher 20 years later with trip-hop pioneers Massive Attack. By itself the song would be stunning. Teamed with “Pair of Dice” and “Asylum Seekers,” two anarchic, bass-heavy versions starring pioneering Jamaican deejay Big Youth over the same rhythm, it’s overwhelming. The man behind “S.90 Skank” and Screaming Target was an obvious choice to work on the track, not only because of his outspokenness and verbal dexterity, but because, like Andy, he’d been a hero to the Clash. The single’s final cut, “Christmas in Ladbroke Grove,” comes from Blowtorch’s own pen, a recollection of the emotions he felt in December 2002 as he learned Joe Strummer had passed away at the age of 50. “Straight to Hell” remains as relevant now as three decades ago. The estimated 60 million people fleeing Iraq, Afghanistan, Syria, and Mexico all prove that. And when the loudest, most incessantly repeated voices are those demanding more walls and barriers all over the world, of turning away the people in greatest need, and sending them straight back to hell, then we need this song and this performance more than ever. "Horace Andy's rendition of the song is heartfelt and timely and Big Youth has added his unique style. You can quote me."